Richard Gasquet v Tommy Haas – The 34 year old veteran Tommy Haas took the first set on the tiebreaker before the ridiculously talented Gasquet blew Haas away taking the final three sets 63,60,60. Profit 11.41 euro. Caroline Wozniacki v Kaia Kanepi – What an up and down match this was again. Kaia Kanepi stormed into a 61,51 lead holding two match points before Woz stormed back to save the match and win the second set on the tiebreaker. The few 100,000 matched @ 1.01/1.02 was looking dodgy at this stage for the backers as Woz went back to odds on in the market but she couldn’t continue the fightback as she lost the third set 63 and thus the match. Profit 11.28 euro. Ana Ivanovic v Sara Errani – Ana Ivanovic the former French Open Champion and former world number one had another poor grand slam result today as she tries in vain to reach them heights of 2008. The girl though now although has flashes of brilliance , is still far too erratic and is a bundle of nerves when a match goes tight and it really is hard to see her winning matches in tight 3rd sets and it was the same old story again today. After romping the 1st set 61, she lost a tight 2nd set 75 and was never ahead in the 3rd as she went down 63. Errani in fairness is at home on the clay and is knocking on the door of the top 20 herself mainly because of what she does in the clay court season. She is very slight but fit and makes ball after ball which works perfectly against somebody like Ana. Profit 23.37 euro. Jo Wilifred Tsonga v Fabio Fognini – Tsonga won in straight sets in an entertaining affair for the most part. Profit 10.46 euro. Petra Martic v Marion Bartoli – A fine win today for Petra Martic, a player who has threatened for a while to have a breakout win but has never delivered. She is a fine player with some massive ground strokes but seems, to me anyway to lack the belief especially on the big points. Well she should have the belief now after beaten Bartoli in her own country at a grand slam on the main court. Bartoli is a funny character who does things her way but my word she is a fighter when she wants something and gives it everything she has but it wasn’t enough today as she lost to Martic 62,36,63 for a profit of 10.46 euro. Gilles Simon v Brian Baker – What a story Brian Baker is. One of the most promising juniors in the world with a glittering tennis career ahead of him, he has been dogged by injuries to a point where his career is only really starting now at 27 years of age. It is a testament to his character that he was able to preserver through all that and come out the other end. In his first ATP tournament in 5 years last week he reached the final and today he was two sets down to Frenchman Gilles Simon before coming back to bring it to a 5th before running out of gas. I hope now that he goes on to have a good career and make a few bob for himself without going through any more injuries. Profit 10.44 euro. Agnieszka Radwanksa v Venus Williams – A comfortable straight sets victory for A Rad 62,63. Profit 13.49 euro. What a day of tennis with the last match of the day an epic battle that lasted over 3 hours and a final game with 13 deuces and 23 minutes resulting in the biggest shock of the tournament as french woman Virgine Razzano knocking out Serena Williams 46,76,63. Williams lead the tie breaker 5-1 with over 5 and 1/2 million match on Williams below 1.05. The match had everything with Razzano leading the final set 5-0 before she started cramping , could barely walk and being penalized point penalty’s before getting the win of her career. I had built up a nice green over the last few weeks on Serena winning the title but in the end I didn’t care. I was so happy for Razzano as she got the win of her career especially after the heartache of losing her fiance last year at a young age to illness. I was involved in a few matches today with a good days profit so before I go to bed I will leave you with the overall picture. Victoria Azarenka v Alberta Brianti Well the world number one got her campaign started against the 105 ranked Brianti in let’s say a very unconvincing fashion. In fairness to Brianti her ranking is a bit high for somebody who has obvious talent but her problem is she is very slight and small and for the most part the other’s power game tennis is just too strong for her. She managed to win the 1st set though in the tiebreaker and built up a 4 nil lead and had a point to go 5 nil up before the wheels came off and Aza managed to up her game slightly. Aza won the next 6 games to take the 2nd set and you knew as I say Brianti did that her chance had gone and so it was with a 62 third set loss. Profit 6.46 euro. Jelena Jankovic v Patricia Mayr-Achleitner Jankovic won in 3 sets 16,6175 for a profit of 11.53 euro. Novak Djokovic v Potito Starace A tight first set that Djoker managed to win in a tiebreak before winning the last sets comfortably 63,61. 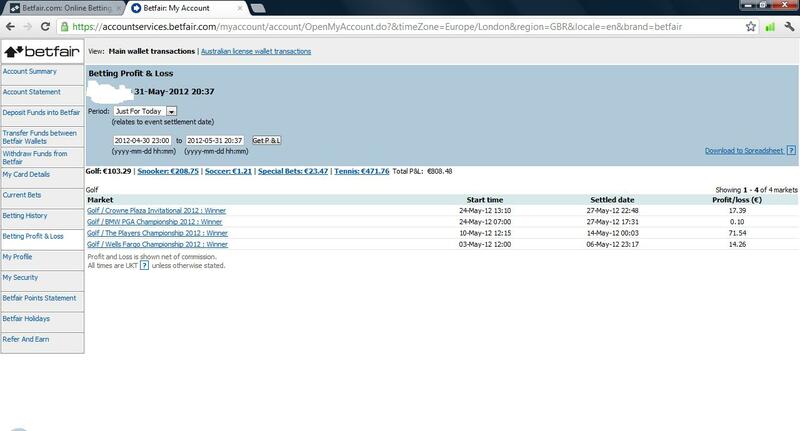 Manged to profit in the set betting market 14.26 euro. Arnaud Clément v Alex Bogolomov Jrn Well what a match this turned out to be with some controversy at the end. The match was 4 hours old when Bogo was serving to stay in the match. He was match point down when he suddenly started cramping and couldn’t straighten his leg to serve and in the end had to forfeit the match. And the rules in Betfair state that all set betting would have to be voided, so disaster for some and a lucky escape I am sure for others. I was only involved in the match odds for a profit of 12.60 euro. Milos Roanic v Rubén Ramírez Hidalgo – The big serving Canadian won 64 62 62 for a profit of 14.27 euro. Gilles Simon v Ryan Harrison – The french man won 36,75,64,61 for a profit of 12.36 euro. I haven’t been well the last few days which resulted in me having to go to the doctor’s and it turns out I have a nasty chest infection so I am on anti bio-tics for that. So just a quick update on yesterday’s results. Zach Johnson won the Crowne Invitational at Colonial to nett me a profit of 17.49 euro. Backed Agnieszka Radwanksa pre match @ 1.25 to Simona Halep in the final in Brussels today. She went into a 42 lead before losing the next 3 games leaving Halep a chance serving for the first set. Halep failed to serve it out and when A Rad won the next two games the market went back to where it was at the start. Such was my fragile confidence I decided to get out and was actually matched @ 1.23. You can then guess the rest , A Rad only lost one more game as she stormed to the title 75,60 leaving me with a profit of 0.95 euro. Oh the joys!!!! Layed Norway prematch 25 euro @ 3.65 and greened up with 5 euro @ 16 at half time with England winning one nil from Ashley Young’s ninth minute strike. It was the full time score too. Profit 19.02 euro. Managed to pick up a profit of 15.22 euro as Sweden romped the Eurovision Song Contest last night. Just the two matches today for me both the semi finals from the WTA action in Brussels. First up was Agnieszka Radwanksa’s defeat of Kaia Kanepi 76,63 which netted me a profit of 12.63 euro. Next up was Simona Halep ‘s defeat of Sofia Arvidsson 64,63 which resulted in a profit 17.30 euro. Welcome to my blog which will detail my efforts to crack the sporting exchange markets. My blog will detail my daily efforts to achieve this with summaries of how my day went and profit and loss reports. Please feel free to leave a comments and I will answer them. Thank you for reading.